This three panel exterior door has one panel above the lock rail and two panels below. 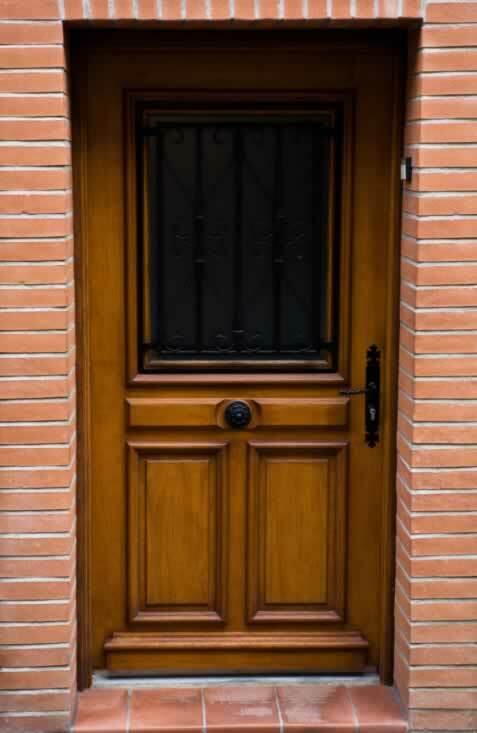 The door is made of beautiful cherry wood with a molded bottom rail. The top panel is a lite (or a fixed window built into the door's panel), which allows for natural light in this entry way, as there are no other windows near the door. For added security, the glass is frosted and a black metal grille has been embedded in the door's stickings. The lower two panels are raised and finished with decorative molding, as is the lite. A decorative black metal rosette draws the eye to the lock rail, which is raised. Other hardware includes a door lever, lock, and matching black metal face plate. This door is fitted with a stainless steel door sweep, which will cause debris and dirt to be cleared from the stoop each time the door is opened.